Bluegrass Hall is a versatile space that allows flexibility in set-up style to meet your event needs. The only permanent structure in this hall is the stage, enabling you to design the space to meet the exact look and feel you desire. This space can easily accommodate Receptions, Meetings, Parties, Reunions, etc. 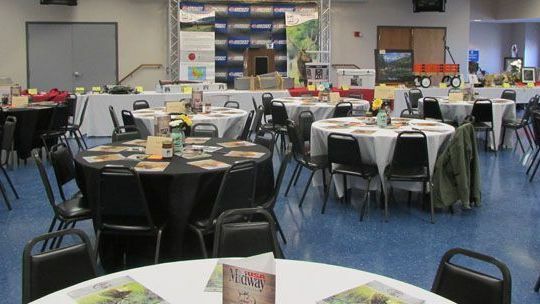 "We had our annual Big Game Banquet in the Bluegrass Hall last Saturday night. It was by far the best experience and best event our chapter has ever had. We could not have asked for a better outcome. Adam Wilhelm was the absolute finest coordinator I have had the pleasure to work with. As far as my background I have attended and worked over 100 of these events and have never been treated better or had a better facility. I wish every chapter across the country had someone like Adam and Pam Mylor to work with. To put it simply we will be contacting Adam in the next few days about coming back next year. Thanks so much!" "I have nothing to say but good things about Kentucky Speedway and the hospitality we were shown by the its employees. Owen Electric has been privilege on more than one occasion to use the Blue Grass Hall and had nothing but a great experience every time! The room was a great meeting space and accommodate our employees very well. We always appreciate the hospitality, help and courtesy of KY Speedway employees. Adam and Pam went above and beyond to meet our expectations and the location was great to host our events! Great Experience and Great Service!"